I use one capsule of this either on to my coffee or on to my breakfast cereal like oatmeal. It keeps your blood sugar in check. Best Cinnamon Extract with Cinnulin PF by Doctor's Best regulates blood sugar and curbs appetite. Cinnulin is more concentrated than regular cinnamon. • Doctor’s Best Cinnamon can help maintain healthy blood sugar levels. • Cinnamon‚ one of the world's favorite spices‚ is an herb with more than 4‚000 years of traditional use. • Recent research has revealed that constituents in cinnamon bark called procyanidin Type-A polymers help maintain the body's ability to metabolize glucose in a healthy way. 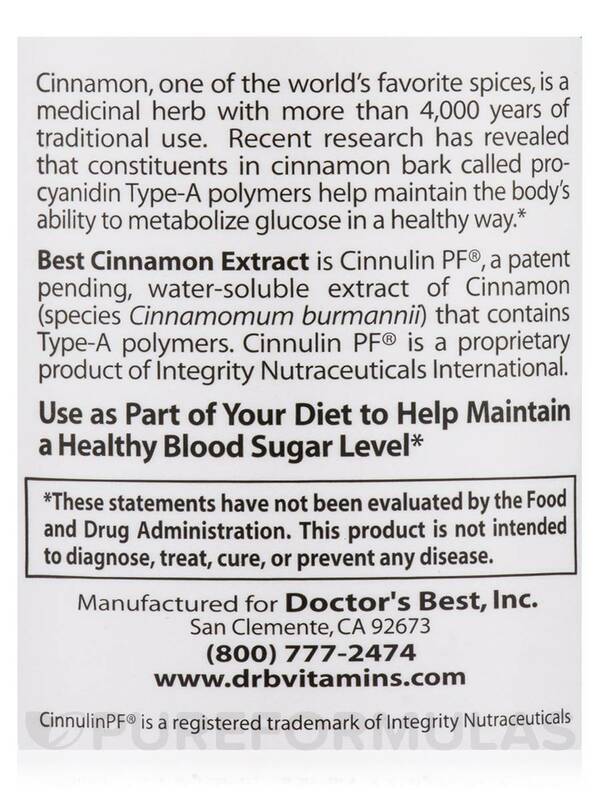 • Doctor’s Best uses cinnamon extract from Cinnulin®‚ a patented water extract of cinnamon that contains Type-A polymers. What is Doctor’s Best Cinnamon? Doctor’s Best Cinnamon can help maintain a healthy blood sugar level. Cinnamon‚ one of the world's favorite spices‚ is a medicinal herb with more than 4‚000 years of traditional use. Recent research has revealed that constituents in cinnamon bark called procyanidin Type-A polymers help maintain the body's ability to metabolize glucose in a healthy way. 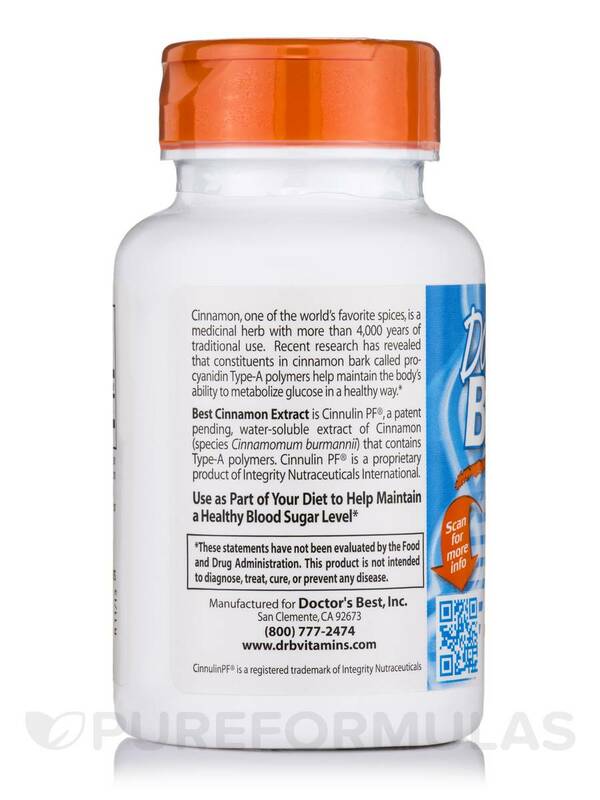 Doctor’s Best uses cinnamon extract from Cinnulin®‚ a patented‚ water extract of cinnamon that contains Type-A polymers. Research has revealed that a number of herbs and spices have blood sugar metabolizing activity. Researchers at the USDA’s Human Nutrition Research Center showed that bioactive compounds in cinnamon facilitate glucose metabolism and storage in fat cells. These compounds stimulate glucose uptake into cells and increase glycogen (stored glucose) production via activation of the enzyme‚ glycogen synthase. The bioactive compounds in cinnamon appear to have their impact at a cellular receptor level. Blood sugar control and storage involves phosphorylation-dephosphorylation reactions. Enzymes known as “protein tyrosine phosphatases” (PTPases) perform dephosphorylation by removal of phosphate groups from residues on proteins. Cinnamon compounds have demonstrated the in vitro ability to inhibit PTP-1‚ a PTPase that inactivates insulin receptors‚ and stimulates auto phosphorylation of these same receptors‚ thereby supporting healthy blood sugar metabolism. Does Not Contain: milk‚ egg‚ wheat‚ gluten‚ corn‚ soy‚ sugar‚ sweeteners‚ starch‚ salt‚ or preservatives. Take 1 capsule before or during a meal‚ two times daily. The various species of cinnamon are classified as GRAS (generally regarded as safe) herbs. The Botanical Safety Handbook lists Cinnamomum cassia a “Class 2b” herb; not to be used during pregnancy. 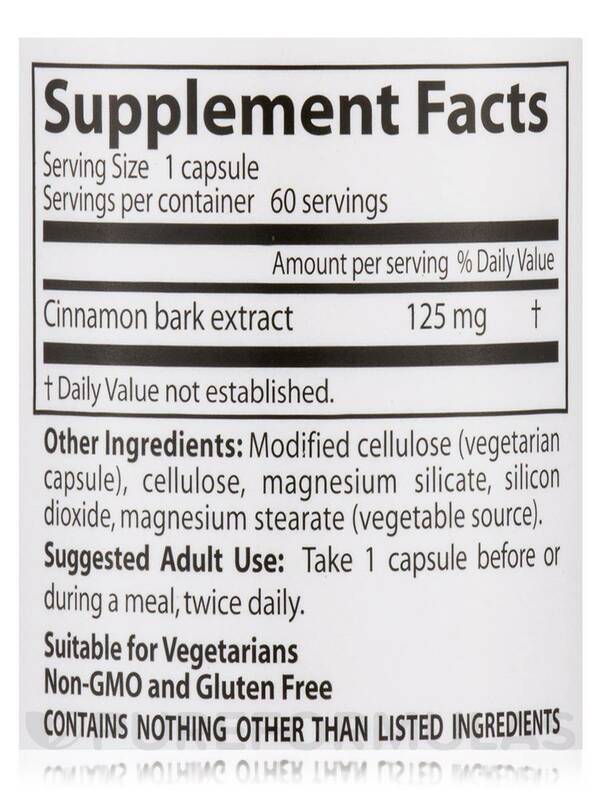 The water-soluble cinnamon extract is largely free of the lipid-soluble components of cinnamon. Best Cinnamon is a great buy! 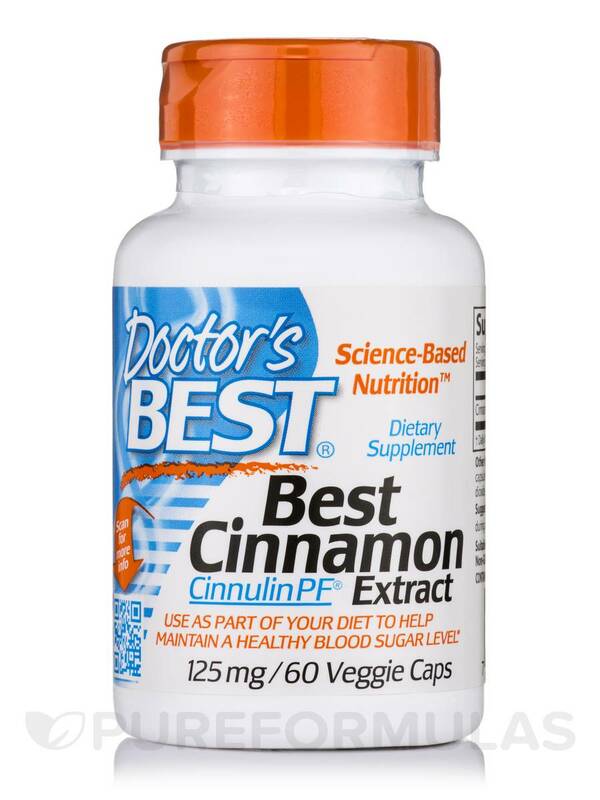 Best Cinnamon Extract with Cinnulin OF by Doctor's Best is very easy to swallow, & tasteless. The size of the pill and the price. 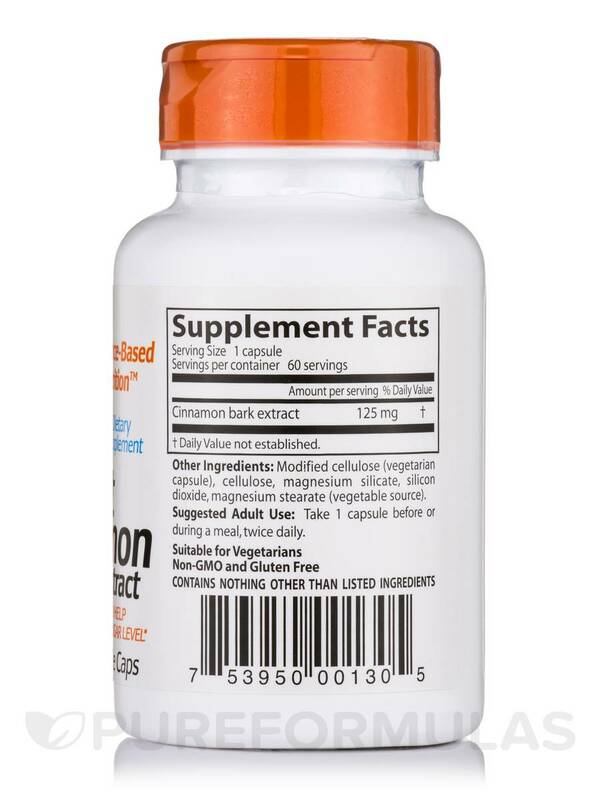 I like this product because it's concentrated and more effective than regular cinnamon. It regulates my blood sugar and reduces my hunger. My fasting blood sugar reduced since I began taking cinnamon. I take this supplement daily to control my sugar reading in my blood test wvery time I visit my doctor because I am a diabetic !! and it works. My blood test is back to normal. Best Cinnamon Extract with Cinnulin PF helps reduce your chances of becoming insulin resistant and/or diabetic because it helps lower blood sugar and also helps a sluggish or malfunctioning gallbladder because it helps me bile out of the gallbbladder.